This is so sad, expecially because she leaves behind a young Chimpanzee that will miss her dearly. The warm thoughts are that at the ending of her life she had a great place of sanctuary, love, and no pain. One of Chimp Haven's first residents who unexpectly gave birth four years ago has died. Theresa, 46, suffered a degenerative orthopedic condition, according to Chimp Haven officials. She died Friday, a day before her youngster Tracy's fourth birthday. Theresa came to Chimp Haven almost six years ago after being used in the U.S. Air Force space program and biomedical research. She and Rita were the first two residents of the haven in south Caddo Parish. Staff members said Theresa and Rita were best friends, working together to keep the males of the growing group of retirees in line. 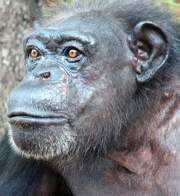 Tracy's surprise birth in 2007 triggered a search for her father, because all the male chimps were supposed to have vasectomies. Chimp Haven workers also were surprised because at age 42, Theresa was supposed to be too old to have a baby. DNA testing showed that Conan, one of the males in Theresa's group, was Tracy's father. Chimp Haven workers discovered that his vasectomy had failed. Teresa has been my C.A.R.E./Friend chimpanzee at Chimp Haven for 6 years...I always referred to her as my "daughter". I visited Chimp Haven Discovery days as often as possible, where I enjoyed watching her enjoy her retirement years with chimp friends and later with little Tracy. I will miss her so much. I so wish she had lived a much longer time at CH, but am grateful for all the joy CH brought her. Bless you Teresa - you will live forever in our hearts. Prayers of comfort for Tracy and all the others. I'm so sorry for your loss as well as Teresa's. Know in your heart that her life at CH was a great one and she had a great friend in you. Your such a nice person to have been her C.A.R.E./Friend and hopefully you will do the same with one of the other Chimpanzees that also needs you as a friend. It's always so sad when a Chimpanzee leave this world, though I'd like to think they are joined with others of their own kind somewhere else. Thank you for your wonderful comment and for saying nice words about Teresa. She will be in our hearts and great memories forever.